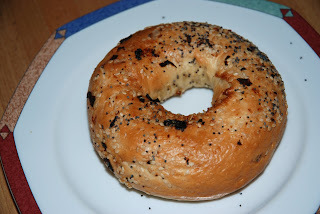 Do you know that bagels used to be a common thing in the Russian Empire and quite uncommon in the USA until early 20th century since people who make them emigrated en masse along with their craft. Also, what is your opinion on бублики, which happen to be closely related to bagels? Thanks for the factoid! I had not known of the bagel's origins although Russia doesn't surprise me. The thing about Brooklyn Bagel is you can't just buy a pack of bagels to take home and toast, butter, cream cheese & smoked salmon as you like. Personally, I find бублики drier and a bit blander than bagels, but everyone has their own preferences! Really depends on бублики's freshness, the supermarket ones often are stale. And for obvious reasons they never come in all those different flavours bagels do (cinnamon and raisin bagels are my favourite, although a bit unorthodox). Any recommendations for good, fresh бублики in Piter? Large bakeries usually have shops of their own, sometimes quite close to the actual factories, and since Russian logistics make sure that transporting a batch of bread within a city takes several days (not really, it's actually supermarket policies that make bread products stale) the shops normally have fresher products. Oh, and also a strange factoid: Семья shops always have staler бублики than Дикси.